On Embarcadero between Mission and Clay St. Valet parking is offered in front of the Ferry Building Monday to Friday from 10:00am to 5:30 pm. After validation: the rate is $12.00 per hour. The maximum daily rate is $60.00. Valet is not available on Saturday or Sunday. ACE Parking Lot is located at corner of Washington Street and Embarcadero just across from the Ferry Building. 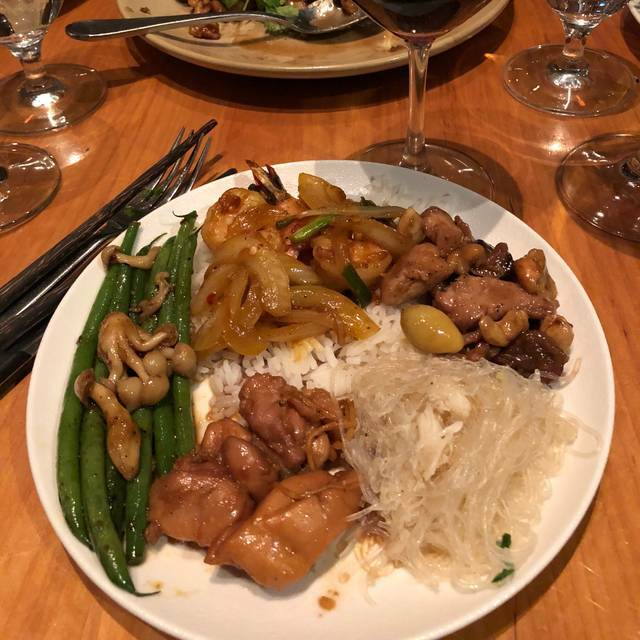 The Slanted Door offers diners a gourmet experience where the food on the plate looks as beautiful as the views of the Bay Bridge and the Bay Lights in the evening from every table. Charles Phan, the executive chef, goes to the root of the dishes to represent the food authentically with a modern twist. The Slanted Door offers lunch and dinner menus with a variety of appetizers, palate cleansers and main dishes. The meals consist of organic elements including grass-fed beef and pasture-raised, cage-free chickens. 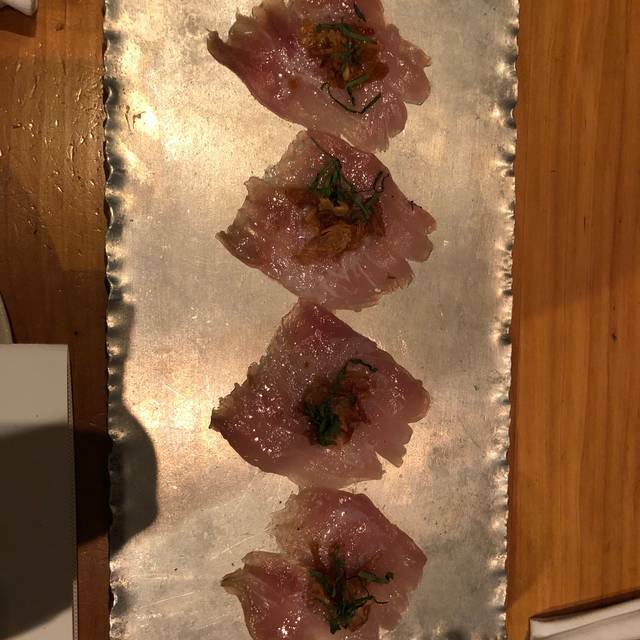 Local seafood options include wild Gulf shrimp, spicy Monterey squid and seared Ahi tuna, or visitors can take advantage of the raw seafood bar. Those looking for a vegetarian or vegan menu will find plenty of options available. The Slanted Door offers a family-style menu and a wide selection of desserts with an extensive bar menu to wash it all down. I love this place. I do wish it were still a small venue in the Mission but I’m growing with the times. It took forever for the food to come out. Like almost 2 hours after we ordered. The waiter was really embarrassed. One person in our party left before it came. I’m going to look for a new SF “go to” place to entertain local friends. Time to move on. Love this place but overpriced for good Vietnamese food. Friends from out of town came in for the weekend so wanted to go somewhere nice. Great drinks, food was good but not worth it for a regular lunch. Don't be shocked when u order appetizers, drinks and 4 entrees.But always good quality food, but overpriced for Vietnamese food in SF. Excellent food and service beautiful location looking over the bay. Very noisy!! The dishes are interesting and delicious, especially the mung bean dumplings and the carrot dish. I came with a group of vegetarians and we were all very happy. Seeing the light on bridge and the water was absolutely gorgeous. The only potential issue here is that the restaurant is very loud on a weekend night. Still, amazing! Menu was more challenging this trip to suite variety of palates, including not spicy and vegetarian. Many dishes of interest either too spicy or with meat. Things we ordered were very good. First time to visit, taking friends from Australia. Everything outstanding! Would go back in a minute! Absolutely! 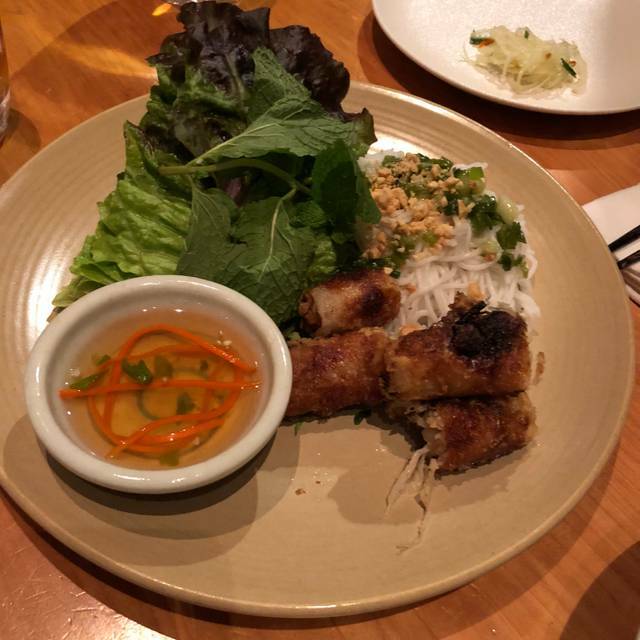 Delicious food, presentation and wine list what it should be for a Vietnamese restaurant. 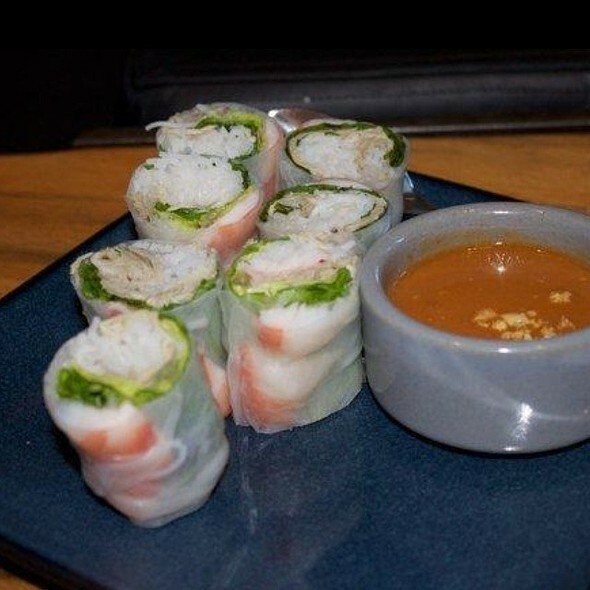 Go with a few folks so you can order more and share to be able to taste all the deliciousness. Sommelier was super helpful. Server was great and table neighbors were fun as well. This is my favorite restaurant, but this meal fell a bit short. The caramelized shrimp were over-sauced, and the sauce was too dark and sweet. 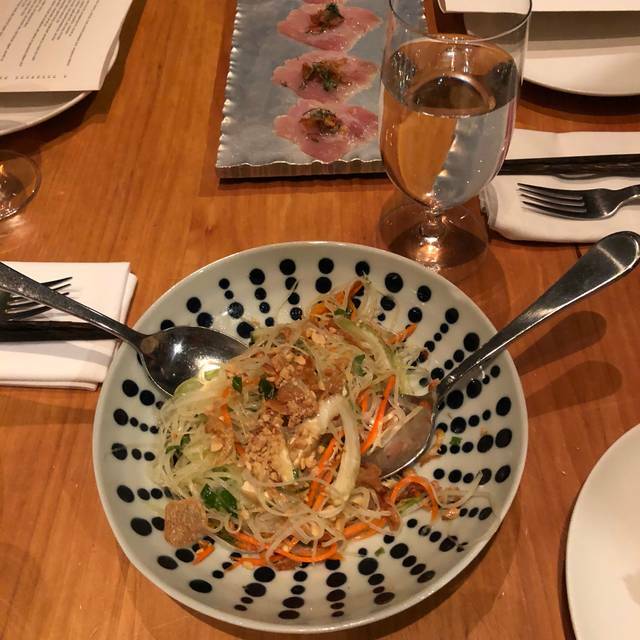 Jicama-grapefruit salad and Cellophane noodles with crab were both superb. Scallops were good, not great. Everything was a little too salty. The service was less attentive than usual, and one dish never came. However, I still love The Slanted Door! Always wonderful food, service. Have enjoyed this restaurant since it was located on Valencia street. Always a special treat. Really noisy but loved the food! The Slanted Door has always been one of my favorite restaurants in San Francisco since they opened in the Mission years ago. Their food is always delicious and cooked perfectly! However it's hard to have a conversation if you're having a meeting since the noise level can be loud. If you do want to have a meeting meal I would suggest you go for a late lunch or dinner when they are not as busy as peak time. Enjoy! The service was impeccable. The food was fresh and delicious. I had fun with cotton candy for desert ! The Slanted Door is always a must when we visit San Francisco! Slanted Door makes consistently great food. I took my sister for her birthday. It was her first time and she loved it. The food was amazing! Very finished taste! The food was incredible. The service impeccable. The noise unbearable. They really need some sound baffling in the dining area. Lovely dinner at Slanted Door. Perfect place to take out of town guests, as they can stroll the Embarcadero beforehand and enjoy delicious food and a water view. We were seated immediately even though we were a few minutes late. It was lunchtime on a beautiful Sunday afternoon and they were busy, but not packed. The cocktails were delicious. The oysters were fresh. The meals were wonderful and filling. A very enjoyable meal. Lived up to the recommendations from friends. Food is great- The service has been going downhill for a while. Management needs to cleanup their act. Overall, the food was very good. The service in the bar was confused, but our table waiters did a nice job. I am willing to pay for quality food, and I rarely mention price, but the prices here reflect a tourist spot. It’s a lovely restaurant, but for the price there are many better choices in SF. Never disappoints. Grapefruit & Jicama Salad, Clay Pot Chicken and Shaken Beef to name a few favorites-fantastic!!! Fun dessert was the confection plate with blue berry cotton candy and other sweet treats-nice for sharing. Food was good, but not amazing. However, what makes this place is the ambiance and the amazing view/location. We had the shaking beef, imperial rolls, cellophane crab noodles. Imperial rolls- again, good but not for the price tag. Noodles were bland. Needed something more - maybe more fish sauce/hot sauce. Shaking beef was delicious- but for almost 50- not worth the hefty price tag. Service was good, friendly and timely. I would only come back for a special occasion. Food was good. Shocked to see entree prices of $40-$50, and then not be that large. Service was fine at first but waiter totally disappeared for long stretches. Frankly I thought it was very poor value despite good food. Servers were top notch and just overall food experience was excellent! Obsolutly fabulous food. Great service. Way too darn LOUD! I’ll be back regardless because the food is fabulous! Lunch seems less noisy. They may have added tables due to high demand which increases the noise. I had a delightful ginger limeade cocktail and the caramelized prawns and carrots. Delicious! Wonderful food and drinks! Try the whole wood fire cooked fish, you won't regret it! Get the Dungeness crab noodles! It's worth it. And the cotton candy is cool. Food is excellent! A little loud for conversation but still one of my favorites. Food is excellent, but using "family style" as a bad excuse for waitstaff to not know which guests ordered which plate or drinks! Also, staff should defer to customers when both standing/walking. Service does not meet quality of the food. Food was great, friendly staff and the bar was excellent. Very, very noisy...couldn't even hear the person sitting across from me. Our server, Ginger, was outstanding. 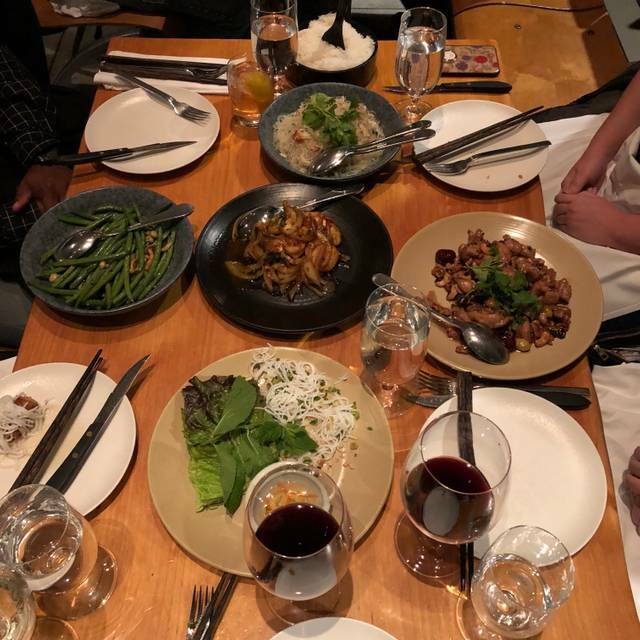 It was my first time to visit Slanted Door and somehow she found the time to answer my questions and even make suggestions on how my friend and I could savor the delights of Slanted Door by sharing plates. She was wonderful and the management should recognize what a treasure they have in her.